Kelly Keeling. I wonder how many out there has the slightest clue of who he is. Sure, for fans of melodic hard rock, the name might just ring a bell and if you’re a fan of John Norum and Michael Schenker, then yes. But for the most of the world, Kelly Keeling is a pretty unknown name. This is a good example of how the world isn’t a fair place because if you look at his qualities as a singer, Keeling should be known to all men and women. He first appeared on the Melodic Hard Rock scene with his band Baton Rouge and their debut album Shake Your Soul in 1990, an extremely underrated album that should have sold millions if the world was a fair place to live in. When the band’s follow-up, 1991’s Lights Out On The Playground failed to take Baton Rouge anywhere, they disbanded and even tough Keeling made a record under the Baton Rouge moniker – a self-titled record – in 1997, that album wasn’t anything more than a studio project between him and songwriter / producer Jack Ponti – Baton Rouge ceased to exist in 1992. Since then, Keeling has worked mostly as a hired hand, first out as a touring member with John Sykes’ Blue Murder – he did sing on one song on Blue Murder’s final album Nothin’ But Trouble (1992) – and as a member of John Norum’s (Europe) band on two records, Another Destination (1995) and Worlds Apart (1996), the two MSG albums The Unforgiven (1999) and Tales Of Rock ‘n’ Roll (2006), Windows Of The World by Heaven & Earth and the useless Hollywood Trash by King Kobra, both from 2001, the latter was nothing more than a solo project from drummer Carmine Appice and has nothing to do with King Kobra at all, but to name a few of his contributions. He also made a solo album in 2005, Giving Sight To The Eye, an album that left me underwhelmed. The thing is, Kelly Keeling has been keeping himself busy, singing on various projects all along, but no really steady band jobs has been visual at all. Until the news were brought that he had formed a bluesy and rootsy hard rock trio with guitarist Vinnie Moore (UFO, ex-Alice Cooper) and drummer Scot Coogan (Ace Frehley, Lita Ford, Brides Of Destruction) called Red Zone Rider (reviewed here), an album that was surprisingly good and gave hope for a brilliant future. There was also talk about a Baton Rouge reunion, but that fell through. Instead we got another solo album from Keeling and to be honest, after his last solo effort, my expectations weren’t that high. The fact that the record is released on Frontiers gives a good hint on what the music will probably be like – and who the songwriters are. When it comes to solo albums and new projects, the record company’s founder Serafino Perugino always has given himself a lot of saying of how the music should be performed and song writer and keyboard player Alessandro Del Vecchio is hired by the company to deliver songs for many of the artists and projects like Revolution Saints and others. Now, the credits says that Keeling is very much a part of the song writing here but the fact that Del Vecchio is also a part of the songwriting is hardly a shocker. The guy do has some really good qualities in that department so his involvement is only positive. The albums opens with “This Love Our Paradise”, a shockingly great AOR pearl with both groove and catchiness and I instantly get a good vibe for the rest of the record. “Isolated Man” follows and it keeps the spirit up with an instant hit feel – a great AOR tune that sticks to the brain like glue. Keeling takes us back to the 80’s with “Sunshine Over Me”, a great and catchy little pop rocker. 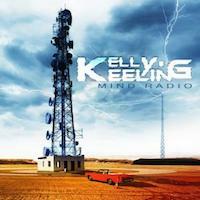 If I was Kelly Keeling, I would release “Still Need You In My Arms” as a single. The song has the chorus from Hell and is screaming HIT! This is AOR at its best. “Written In Fire” is more Melodic Hard Rock than AOR and has a more bluesy feel. Think Keeling’s other band Red Zone Rider with a more pop twist and you’re close. “Take Me To The Limit” makes me think of early King Kobra, a great Melodic Rock tune with an 80’s twist. But things aren’t over yet. “Love Will Tear Us Apart” is an acoustic based hard Pop song with a contagious chorus – this is brilliant and I get a hit vibe by this one as well. “No Man’s Land” is another killer, but instead of straight AOR, Keeling goes Pomp Rock here and I start to think about bands such as Kansas, Trillion and Styx combined with an early 80’s AOR sound like Streets. We get Journey and Toto in a fine mix in “Frozen In Time” and in “Monkey House”, Keeling bring us back to the early 90’s Melodic Rock and his old band Baton Rouge. My guess is that that song was written for the Baton Rouge reunion that never happened. “Ride Out The Storm” is another pearl and we’re back in 1980 something and the influences from bands such as Streets, I-Ten and Wrabit are obvious. Keeling closes the record with “Who Do You Run To”, an uptempo groovy AOR-rocker with a brilliant melody that make me want to listen to the record all over again. I’m really surprised how good this record is. I had no doubts what so ever about Keeling’s qualities as a performer and vocalist, but as a song writer, I must admit I’m in the dark a bit. Despite being a fan of Keeling’s earlier work, I’m really clueless of how much of the material is written by Keeling. Baton Rouge, for instance, had the whole band plus outside songwriters such as Jack Ponti and Vic Pepe, so it’s not easy to know exactly who wrote what. He also has song writing credits with both John Norum and Michael Schenker, but I’m afraid those albums, if not bad, but maybe not that impressing either. Still, both Norum and Schenker were the bosses then so how much artistic freedom Keeling had with those projects are unsure. But with the great debut album from Red Zone Rider – man, I hope they make that a “real” band and continue to make records and maybe tour – and this solo record, things sure looks bright for Keeling. And with his feet back in AOR and Melodic Rock, maybe that Baton Rouge reunion that fell apart might happen after all. But until then, if AOR and Melodic Rock fans are looking for something really good to rest their ears on, buy this.